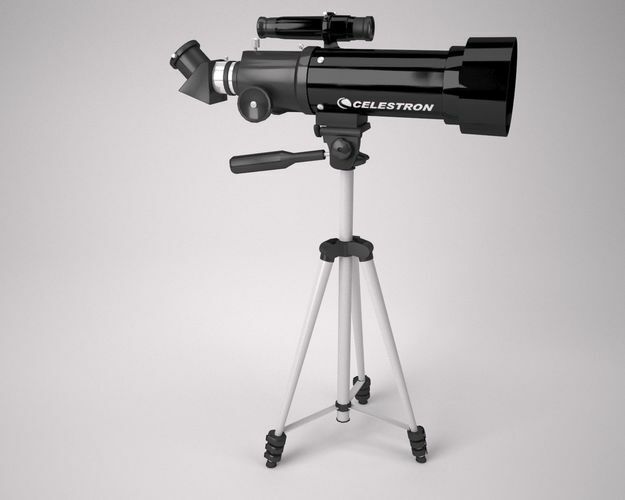 This telescope is created after high resolution photographs of Celestron 21035 70mm Travel Scope, the best selling room telescope on Amazon. The model is textured in full and has been carefully unwrapped. The renders presented here have not been processed. Rendered and textured using V-ray 3.0 in 3ds Max Design 2014. -High quality polygonal model, scaled for accurate representation of the real telescope. -Modeled for polygon eficiency. -Low poly model: 7454 verts, 268 Triangles, 6874 Quads -No mesh smooth modifier applied -Exported as .obj for blender, cinema 4d, daz studio and maya. -No cleaning up necessary -No plugins necessary for oppening the scene. -logo map included -Turbosmooth can be applied but it will need a few swift loops to maintain the edges. Did not include them in the model so I can maintain the low poly design.